Now it is easy to book classified ads in Dainik Jagran Newspaper through Online booking process. You just need to follow few simple steps process to get your ad published in Dainik Jagran Newspaper. There are various options available to advertise in Dainik Jagran. The major one are Classified Text Ad, Classified Display Ads and Display Ads. You need to understand the difference between this three before choosing the option. Once you understand and choose the right option and complete the ad booking. Go to Dainik Jagran Ad Booking Page. Check out editions list with Ad Rates mentioned for Dainik Jagran Newspaper. You can select individual edition or available package for Dainik Jagran Newspaper. Select desired date from the Calendar to publish your ad in Dainik Jagran. You can also choose Special offers if you wish to advertise for multiple days. Finally, Review your ad booking for Dainik Jagran Newspaper and register yourself then pay online through Debit Cards, Credit Cards or Net Banking. After you successfully make payment you would receive a booking confirmation email from us. Post editorial review your ad would get published in Dainik Jagran Newspaper. Dainik Jagran, a Hindi language daily newspaper having a power base within the Northern part of India. 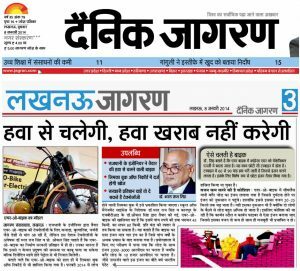 Dainik Jagran is the largest read daily having over 55.7 million readers. Dainik Jagran’s 37 editions are printed across eleven states of India. which has Uttar Pradesh, Uttarakhand, Uttranchal, Delhi, Punjab, Haryana, West Bengal, Himachal Pradesh. Delhi + NCR – (307,200 copies), Bihar – (302,634 copies), Punjab – (265,439 copies), Kanpur – (259,212 copies), Meerut – (226,511 copies), Lucknow – (200,645 copies), Bhagalpur – (165,625 copies), Varanasi – (163,149 copies), Muzaffarpur – (154,321 copies), Jharkhand – (141,000 copies), Dehradun – (128,598 copies), Gorakhpur – (122,238 copies), Agra – (100,828 copies), Bareilly – (80,342 copies), Hisar – (73,678 copies), Allahabad – (71,733 copies), Dhanbad – (65,138 copies), Moradabad – (61,000 copies), Jamshedpur – (55,997 copies), Jhansi – (47,913 copies), Panipat – (42,542 copies), Aligarh – (41,000 copies), siliguri – (21,037 copies), Jammu & Kashmir – (18,683 copies), Dharamshala – (18,000 copies), Nainital – (12,000 copies), Jalandhar, Ludhiana, Ranchi.